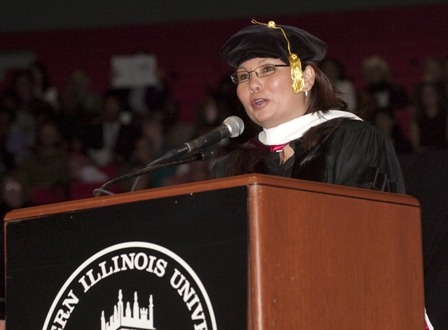 Tammy Duckworth delivers remarks during NIU Graduate School commencement ceremonies on May 7, 2010. Duckworth had been pursuing a Ph.D. at NIU before she was deployed to Iraq. She accepted her honorary degree during the Graduate School commencement ceremony on Friday, May 7, at the NIU Convocation Center. “Tammy Duckworth is a model citizen and a true American hero,” NIU President John Peters said. In the 1990s, Duckworth began pursuing her doctoral degree in NIU’s Department of Political Science, where she studied comparative politics and international relations with an emphasis on Southeast Asia, a university-wide area of specialization. The daughter of a U.S. marine who fought in Vietnam, Duckworth herself was born in Thailand and is fluent in both Thai and Indonesian languages. During her time at NIU, Duckworth was a recipient of the highly competitive Foreign Language and Area Studies Fellowship, offered by the NIU Center for Southeast Asian Studies. She spent time working as a research assistant for the Center for Governmental Studies and also coordinated a university project to measure radon levels in DeKalb County homes. Her study was the first-ever radon measurement program of more than 500 homes in a single U.S. county. Duckworth’s doctoral studies were cut short, however, when her Illinois Army National Guard unit was deployed to Iraq. During a mission north of Baghdad in 2004, her aircraft was ambushed and a rocket-propelled grenade struck the helicopter she was co-piloting. She continued to attempt to pilot the aircraft until losing consciousness from blood loss. Following her recovery, Duckworth dedicated her life to public service and emerged as a national figure, advocating on behalf of veterans and disability rights. In 2006, she was narrowly defeated in a bid to represent Illinois’ sixth congressional district. She subsequently was appointed director of the State of Illinois Department of Veterans Affairs, where she implemented many first-in-the-nation programs for veterans, especially in the areas of health care, mental health, housing and employment. President Barack Obama nominated Duckworth to serve as the Department of Veterans Affairs (VA) Assistant Secretary for Public and Intergovernmental Affairs. She was confirmed by the Senate and sworn in April 24, 2009. As assistant secretary, Duckworth represents and advises the secretary of Veterans Affairs on matters relating to media and public affairs. She directs departmental communications and oversees programs relating to intergovernmental relations, homeless veterans, consumer affairs and the department’s six national rehabilitative special event programs. A major in the Illinois Army National Guard, she declined medical retirement to continue her service. In 2008 and 2009, Duckworth completed the Chicago Marathon on a hand-cranked bicycle. She has also resumed flying as a civilian pilot. “Tammy is an inspiration to millions of Americans,” said NIU political science Chair Christopher Jones, who on behalf of his department nominated Duckworth for the honorary degree.